Image caption The campaign group Camra says pubs are being targeted in "the absence of proper planning control"
New laws must be introduced to make it harder for pubs in England and Wales to be demolished or converted into shops, pub campaigners have said. The Campaign for Real Ale (Camra) says 31 UK pubs have closed every week this year - a rise of five a week on 2013. The group said it was "perverse" that pubs could be demolished or converted without council planning permission and has called for a change in the law. The government said councils already had powers available to protect pubs. Under planning laws introduced in England and Wales in 1995, pubs can be turned into shops, supermarkets or a number of other businesses without planning permission from local authorities. However, Camra has called for the government to tighten planning legislation, making it harder for developers to convert pubs and obliging them to apply to local authorities for permission. 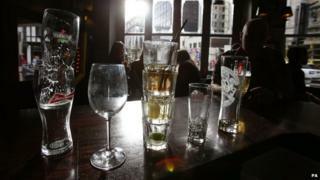 The campaign group said an average of two pubs a week had been turned into supermarkets since 2012. The move has already been backed by 44 MPs in the UK who have signed an early day motion in Parliament supporting the campaign. Tom Stainer, from Camra, said pubs were being left vulnerable by "gaps" in the planning legislation. "Pubs are increasingly being targeted by those wishing to take advantage of the absence of proper planning control," he said. "A pub is an entirely different proposition to a convenience store, estate agent or funeral directors and the planning system needs updating to reflect this fact. "It is time for the government to stop standing by while pubs are being targeted due to gaps in planning law." It comes as campaigns to stop pubs being converted into supermarkets have been launched in areas such as Hereford, Braintree, Chesterfield, Reading, Harrogate, Lowestoft and Bognor Regis. However, communities minister Stephen Williams warned that "excessive" restrictions on changing the use of buildings would be counter-productive. He said it could lead to "more empty, boarded-up buildings". "The best solution is for Camra and campaigners to keep using new rights to list their favourite locals as community assets - nearly 500 pubs have already been protected. "The government has also cut business taxes for community pubs, abolished the unpopular beer and alcohol duty escalators, axed the cider tax and made a pint 8p cheaper than under the beer duty plans of the previous administration," he added.